As some of you know and have already experienced, photographers are being asked more and more for video. This is evidenced in the industry by the numerous articles you find in trade publications on the subject. Another industry indicator is the fact that for the first time, the PhotoPlus Expo is offering a complete Video and Multi-Media track for their seminar series. When we were conducting the research for fotoQuote Pro 6 we saw video for the still photographer as something more than just a trend, we saw it as a viable new market. 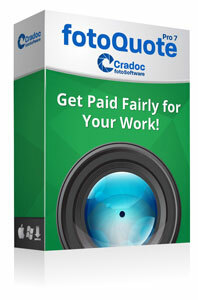 A place where photographers could expand their skill set and make money doing it. I am happy to see more and more opportunities become available for photographers to gain experience in this field. Video, shot specifically for a client or for stock clips is a trend that grew quickly into a full-fledged market and it is here to say. With the majority of your clients having a website and wanting to incorporate both stills and video, at some point, if you haven’t already, you are going to be asked if you can provide both. With this in mind, I wanted to share from our research some of the ways to help you transition to video as an added service option for your existing clients. One of the reasons that this market is now available to you is simply cost. Twenty years ago the average person couldn’t do video, they couldn’t afford the camera or the editing. Now this has changed. Everyone can afford to shoot video now. Before we go any further, I feel I must insert a disclaimer here. I am not saying that because video is more affordable anyone can to it, I am not drawing the same comparison to someone who owns a digital still camera automatically being considered a professional. Being able to shoot video is simply another tool, a skill set that you can offer to your clients just like you’ve already done with the digital still cameras you own and the knowledge you had to gain in order to use them. As with any new tool you will need knowledge and experience in order to make use of it and to make money from it. Shooting video is no different and there are more and more opportunities available to you to learn, such as those presented at the 2010 PhotoPlus Expo. A big difference between still photos and video is the licensing. In those cases where video footage is shot on assignment, “buyouts” are more common than it has been for stills. If the Discovery Channel, for example, is going to fund a project, they own the film. It’s the standard way the film and video industry has worked forever. The way this is handled in fotoQuote Pro 6 is that some of the uses, especially the non-advertising usages, are licensed in perpetuity. On the other hand, the more traditional licensing of stock footage for television is more common. It is not used in feature films because they have a budget to shoot what they need. Television and the Internet are the biggest users of commercial stock footage. 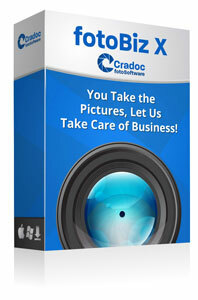 Presentations, training or promotional videos are a few other examples. One of the still photographers we interviewed who made the switch to video shared with us that most of his video work has come from clients that he was already shooting stills for. When it comes to estimating a video job, there are some standard questions to ask of your client: What do you want the video to achieve? Program length, format and style? Do these sound familiar? I hope so because they are some of the very same things you would ask when estimating a still shoot. 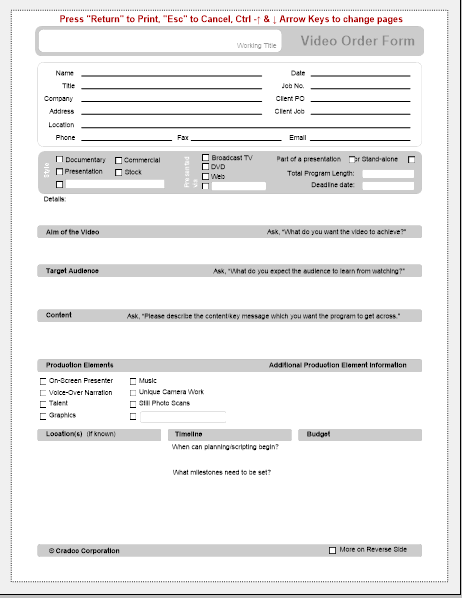 In fact, we have included a Video Pre-Production Form in fotoBiz X much like the Stock Order Form we have provided for years. When it comes to production you’ll include many of the same things for a still assignment job such as travel and location expenses, props and wardrobe, equipment costs, etc. Below are some of the things that may be new to you for a video shoot. Labor: On a still shoot you may have labor in the form of a first and second assistant. For video, it is similar but different in that these jobs are very specific such as a camera assistant, gaffer, key grip, boom man, etc. Talent Costs: For a still shoot you may have models and/or talent agency fees. With video you may also need a scriptwriter, extras and voice over. Post Production: With video you may have the element of sound that you need to plan for. As a result things like music, sound effects and audio mixing will need to be budgeted. The above is by no means a complete list, it is simply meant to give you an idea of some of the differing items you may need to expense and budget for on a video shoot as opposed to a still shoot. In some cases, you may cultivate a “production team” of people that you go to on a regular basis to do your editing, high-end sound work or voice over. For these expenses, you would charge a markup for their time just like you would for your various expenses on a still shoot. 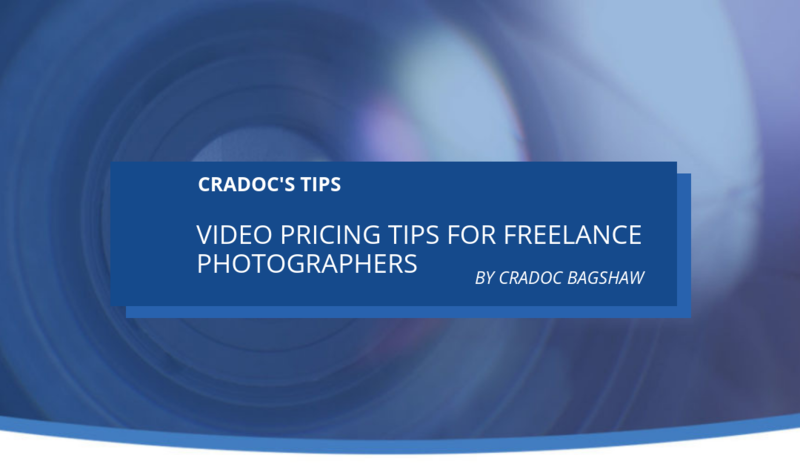 When it comes to these fees and expenses commercial video clients are less resistant to seeing all the different fees than still photography clients. They are accustomed to seeing it all itemized. There are many types of estimating forms available to you. Here are a few resource links. Depending on the size of the job, you may want to consider hiring a freelance producer to oversee the details of the job. For large jobs, it is not unheard of for your crew be double that of what you would have for a still shoot. When shooting both still and video for a client, be sure to budget your time appropriately. It is important that you are clear about what is most essential to get because when you are pressed for time it will be near impossible to do both. 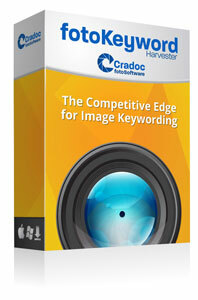 The philosophy of what to charge is similar to that of pricing usages for still photography. If they are doing national broadcast television you would charge more than if they are doing a one-time ½ hour show at a university. Working with your client in reference to the available budget is also the same as the type of negotiations you face with still photography. If they want to negotiate down then they have to give something up either in rights or production value. You can review the rights with them to see where things can be trimmed or you can suggest making the video shorter, eliminating graphics, changing the sound, etc. The video shooter we interviewed shared with us that the way videographers and filmmakers make their money is not by the creative fee, it’s by breaking down every expense and every minute they spend on a project and charge for it. Each expense has a certain rate. One person can do everything, but there are different charges for different tasks. For example, you may do both the editing and the shooting but you don’t necessarily charge the same rate for each. For those jobs where you are shooting just video, because of your experience in still photography, you may be asked in the middle of the production to shoot stills too. Handle this the same way you normally would when a client makes changes mid-stream, but keep in mind that if you are using talent, the models and their agents may expect to be paid for both types of media use. As addressed in last month’s tip on protecting your digital rights the misconception is also true in the video and film world that clients expect to pay less for content that is meant for Web. Streamlining your production process will be a way for you to keep your hard costs down and as a result, provide a reasonable price for your client as well as something that is profitable for you.